This delicious recipe was submitted to us by a guest blogger and looks delicious. I love that it's completely made on the stove-top so it's a great one for all of you who love Stir Fry recipes. You can click on the "share" button at the bottom of this post and a new window will pop-open so that you can print out the recipe to add to your collection. In a glass measuring cup, measure out your soy sauce, add vinegar, water, sesame oil, ginger, garlic, red pepper and mix in the corn starch. Whisk together and set aside. In a wok style pan, set it on high heat and add the oil. Once the oil and pan is hot, add the meat and continue to stir it until it is browned and about half way cooked through – about 3-4 minutes. Remove it from the pan and set aside. Add all of the veggies and your sauce (whisk again before adding) into the pan and stir frequently to cook through. 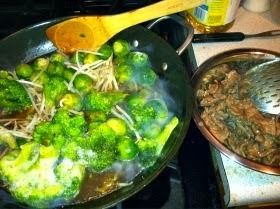 Once the veggies are almost tender, add the meat back into the pan and combine everything together. Let simmer for a minute or two. 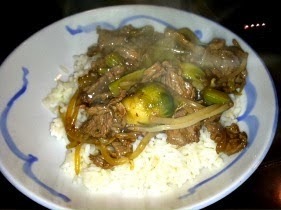 Serve with rice and additional soy sauce. I have decided to make more stir frys since they are both healthy and quick to prepare, so I was glad to find this recipe in your blog. I love all the flavors and shall be going to my Asian market to buy more Asian vegetables.